Why do we need to configure attribute filtering? RADIUS packets contain various "attributes" which can be generated by the network access server (eg. AP or switch) and at RADIUS servers that handle the packets during authentication and accounting exchanges. Certain attributes play a key role in the process of correct assignment of the user to an appropriate VLAN. Depending on the manufacturer of the equipment, these can be RFC-defined attributes or vendor-specific ones. Problems can arise when a roaming user attempts to authenticate at a visited site and the values of the attributes that have been set either cannot be correctly interpreted or result in unpredictable effects on either the Visited or Home networks. This will be a particular problem if the Visited and Home networks both utilise equipment from the same manufacturer and so use the same attributes. To prevent the above situation, sites providing an eduroam(UK) service must employ attribute filtering at their ORPSs. In particular, sites offering a Visited service must filter attributes in incoming return access-accept packets. Visited sites should also filter out any troublesome attributes that are set by devices on their networks during the attempted visitor connection process. Good practice and good neighbourliness dictate that Home sites should also filter certain attributes in those access-accept replies outbound from their sites. This will avoid their own roaming users experiencing problems resulting from attributes that are applied during authentication by the Home site ORPS. In some special circumstances, organisations may have agreed a common usage of attributes, for example where there is a pool of students shared between a number of institutions and similar VLAN assignment policies have been adopted at the sites involved. In these cases the institutions should implement realm-dependent attribute filtering rules. Some organisations do not employ RADIUS VLAN assignment and have just the one network (eduroam) for both guests and own staff/students linked to the eduroam wireless service. Such organisations do not need to worry about incoming Access-Accept VLAN assignment attributes causing problems since their network access servers (APs and switches) will effectively be 'hard set' to a particular VLAN. When setting up a Visited eduroam(UK) service, the Visited site organisation must ensure that visitors are correctly assigned to the eduroam guest VLAN. This can effectively be accomplished by configuring the APs/switches to listen for and act on RADIUS attributes. With Microsoft IAS/NPS, the relevant attribute values can be applied by the Visited site RADIUS server through both the RADIUS server network policy and connection request policy. The required result is that the relevant VLAN assignment attribute is set to the appropriate VLAN value depending on whether the user is a guest or a member of a particular user-group at the Visited institution. This attribute can then be used by the AP/switches to assign the user to the relevant eduroam or user-group VLAN. The above works fine when only local realm users connect to the network. However when users from remote sites attempt to connect to the network, a problem can arise as the result of the user's Home RADIUS server applying various attribute values which are relevant only on the Home network. The returning Access-Accept packets if passed unmodified to the APs/switches on the Visited LAN contain VLAN-associated attributes which cannot be interpreted or acted upon by the Visited network APs/switches. The result is that the visitor will fail to be connected to the eduroam guest network. What’s the issue with Microsoft IAS and NPS? 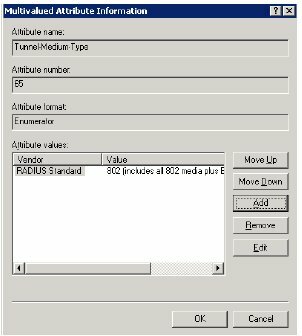 With most RADIUS server software, attribute filtering is straightforward, however with Microsoft IAS and NPS (in current implementation) there is unfortunately no method of removing specific attributes. Instead the only way to ensure that spurious attributes do not cause problems is to override the attributes that might be set by RADIUS servers at Home institutions and to replace them with ones that will not cause problems. What filtering / replacement is needed? The attributes used for VLAN assignment by the network access servers on the Visited site network need to be identified. Filtering / attribute replacement can then be configured to protect these. Some of these attributes will be vendor specific and if there is more than one vendor of APs/switches on the network, the full list of attributes will be greater than those in the example below. Be aware that problems can manifest themselves some time after an initial deployment and configuration of your eduroam guest network. For example you may suddenly receive visitors from an organisation site that has recently deployed new equipment from the same vendor as the equipment on your network (or part of it) or you deploy equipment from a new vendor and your filtering / attribute replacement rules which were fine before but now will have left your network vulnerable to problems caused by the new attributes. Under Microsoft IAS, expand the Connection Request Policy folder and select the “Connection Request Policies” group to reveal the two policies that will have been created (for Home user connection and Visitor forwarding). Open the connection request Forwarding Policy (the policy for visitors which forwards requests from non-local realms to the NRPS). Select “Edit Profile”, then select the “Advanced” tab. From the Attribute name list select “Tunnel-Medium-Type”, then select “Add”. OK all the open windows. Repeat the above process from step 3. This time choosing “Tunnel-Type” in step 5 as the attribute and the eduroam VLAN name or number id you want your guests to be placed on. Repeat the above process for relevant VLAN assignment attribute (on Cisco networks this will be “Tunnel-Pvt-Group-ID” – see list in previous section for the attribute name used with other vendors). The value of this attribute is usually the name of the VLAN as set on the AP/switch. In some cases it is the VLAN number. This must be established either through testing or checking the documentation. This document was produced at the result of problems encountered during deployment of Microsoft IAS to support 802.1X and eduroam as a new installation at Royal Holloway University of London. Thanks to James Borne (Royal Holloway University of London), the originator of this document and to Alexander Clouter of SOAS for his extensive help with troubleshooting this issue.